In Fall 2015, the Oreon E. Scott Foundation awarded the Christian Church (Disciples of Christ) in Indiana a grant to implement a reconciliation program for the younger generation of our region. Born out of the common desire to do more in addressing systemic racism, after an inactive period due to change in the leadership of the program, the project has been redesigned. The main goal is that our own youth can create safe spaces for learning and developing a true community that ultimately will embrace and promote the mission of reconciliation among their peers and especially within their congregations. How will they accomplish this? Visiting/learning from local sites and organizations working for racial justice and reconciliation. Creating a shared mission for racial justice and reconciliation according to the pressing needs of society. How will this happen? We’re glad you asked! The plan is to gather throughout 2018 as many youths as possible (7th through 12th grade) to talk about the intersection of race and other social issues in society. There will be two all-day retreats and four experiential gatherings in which we will discuss the intersectionality of race and other topics/social aspects (i.e. 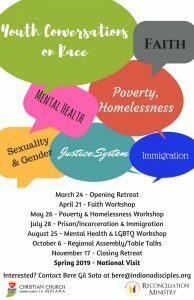 poverty, homelessness, the justice system, immigration, mental health, and gender/sexuality). See below for the updated dates. Depending on the congregations participating we will rotate the location of our meetings. We encourage all Youth Leaders, Youth Ministers and Pastors to sign up the youth in their congregations (even if it is only one!) and attend these events. The youth attending both of the retreats and at least three of the five experiential gatherings will be able to apply to go on a national trip the first week of Summer 2019 (right after the youth get out of school) to learn more about justice and reconciliation. We are still defining the planning and logistics of the trip to visit different organizations in the state of Georgia. There will only be 6 seats available for the national experience! The youth going on the national visit phase of this project, in partnership with their local congregation, will cover the $100 registration fee to assist offsetting some of the costs of travel, lodging, and meals from the grant’s funds. We firmly believe that TODAY is the day to provide spaces for our younger generation to develop a deep sensitivity and commitment for justice and reconciliation! So, we pray that your youth may be energized about this project and that they can join us for the regional phase of it and then apply for the national trip! When are the gatherings happening? Where are the gatherings happening? Depending on the congregations participating we will rotate the location of our meetings. Please check out the events on our Facebook page for dates. All the regional gatherings throughout 2018 will be free, and those who after having applied were selected to participate in the national visit will cover a $100 registration fee to offset some of the costs from the grant’s funds. We encourage congregations to either partner with their youth in covering this fee or fully cover it. In the event that neither the youth family or congregation are being able to cover the $100 fee, please contact our regional office; we do not want finances to become an impediment for youth to apply! Will there be food at these events? Lunch will be served at the opening and closing gatherings (April 14 & November 17), and snacks and drinks will be available during the open dialogues events (May 26, July 28, August 25, October 6). What if I graduated by the summer of 2019, can I still apply for the national visit? Absolutely! As long as you were registered between 7th and 12th grade by the first of the gatherings, and you fulfill the requirements you can still apply! What are the requirements for the national visit? Having attended at least either the opening or closing gathering (April 14 & November 17), AND at least one more of the open dialogues (May 26, July 28, August 25, October 6). Complete the online application by December 31, 2019. How or where do I submit my application? Monday through Thursday, 8:30 a.m. – 5:00 p.m.